For the Easter weekend we’re feeling egg-cited (sorry – will try to keep the egg puns to a minimum, honest)! A few tickets are still available for the fabulous ukulele wielding Marilyn Monroe – aka Laura Nixon, on Thursday, either a £10 ticket for this fantastic show, or treat yourself to the three course cabaret dining menu, with a glass of fizz on arrival for £35 each, tickets here. DJ Jazzlord will play Cuban beats from 10pm (£5 after 10), and remember it’s Good Friday the next day – so party on people! You can party with us all weekend, with great cocktails and DJs on Friday, Saturday is Rum Night, usual cocktails plus some special yum rum ones and funky, summer, holiday tunes, and Sunday is Sunday Night Live, inspirational music and poetry from Cambridge’s most talented. 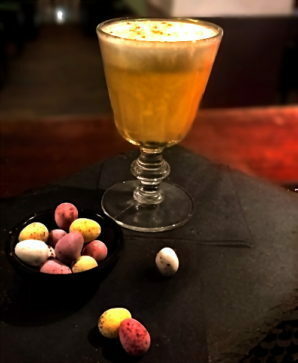 If that is not enough as an Easter special we not only have our tasty and terrific, three for £12 on tapas, but our super-skilled bartenders have whipped up a delicious Easter cocktail, egg-specially for you (oops). Pretty in Peach is frothy, citrusy, and comes with mini eggs! What’s not to love? Here’s the recipe to tempt you some more! Happy Easter and see you over the weekend. Cheers!